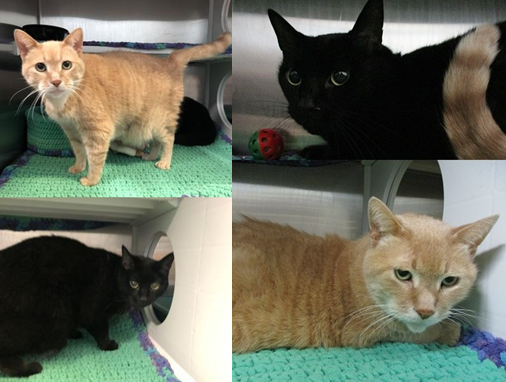 Romeo & Julian are 10-year-old neutered males. They are both declawed on their front paws. Romeo is black with white on his chest. Julian is a red tabby. Both cats have been indoor only, and that is how it should stay, as they do not have front caws to defend themselves or climb outside. They are fully litter trained without issues. They may not have their claws, but they still like to have a scratching post, and they will both use it. They can be shy at first, but with time they will come around. They are both friendly. Julian has settled in quickly and is already wandering the cage and coming up for pets. Romeo is taking a little longer, he is clearly relying on Julian for support since being here at the shelter. These boys have only ever lived with adults, and would do best in a home without children, as they prefer a quieter lifestyle. They DO NOT like dogs. We would like to see Romeo & Julian be adopted together. If you were looking for a couple quiet, senior kitties, these two would make a great addition to your family. If you are interested in meeting them, you can drop into the shelter at 527 Avonlough Road, Belleville. Cat Adoption fee of $140 includes; Spay/Neuter, first vaccination, general deworming, advantage if needed, microchip, four weeks of free trial pet insurance and a free exam at a local participating vet. Items needed: Canadian Tire Money, Clorox bleach, heavy duty garbage bags & wet kitten food (pate). Copyright © Quinte Humane Society.